It’s hard to believe that the journey that’s seen Sora, King Mickey, and those hearts they’ve touched finally come to a close after so long. 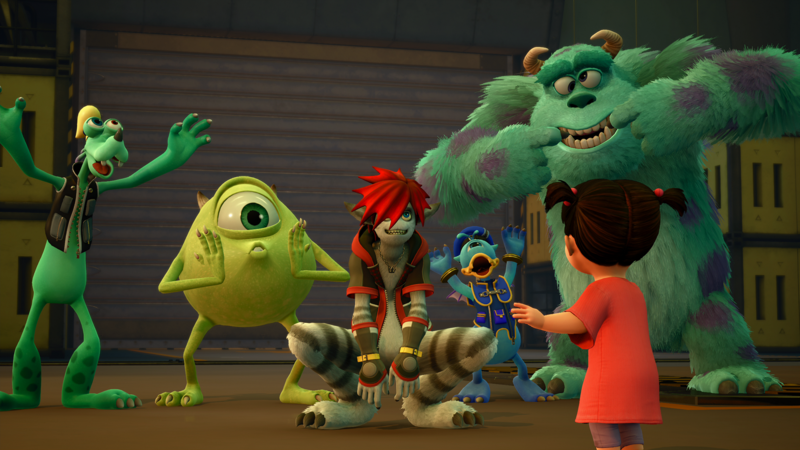 For many fans, Kingdom Hearts III has been a title they’ve been waiting most of their lives to finally play. Over the past decade and a half, new sequels and spinoffs have been released on most popular platforms and few other series could hold the honor of needing as many consoles to play through just to get the full story so far. It’s been a long journey of card games, mobile social games, and remasters on the two most recent Sony platforms. Now, all of those years of lore and dramatic fights surrounding The Keyblade War or heartless antagonists is coming to its final curtain call in Kingdom Hearts III. If you haven’t played through every Kingdom Hearts before, or watched a primer on YouTube at the very least, there’s a high possibility that the nuances to the characters and story of Kingdom Hearts III will be lost on you. The relationships between Sora, Roxas, the Twilight Town youth, and of course the black-hooded members of Organization XIII, are all hinted at throughout the cutscenes of Kingdom Hearts III but never fully explained. Many of the plotlines running through the Disney worlds are built upon the past decade and a half of Kingdom Hearts titles with the true payoff existing for those faithful to the long-running story. For those that might even consider Kingdom Hearts III their first of the series, the underlying plots surrounding Organization XIII at large will largely be missed but there’s still a significant tale of light and darkness presented in a way that only Disney could devise. 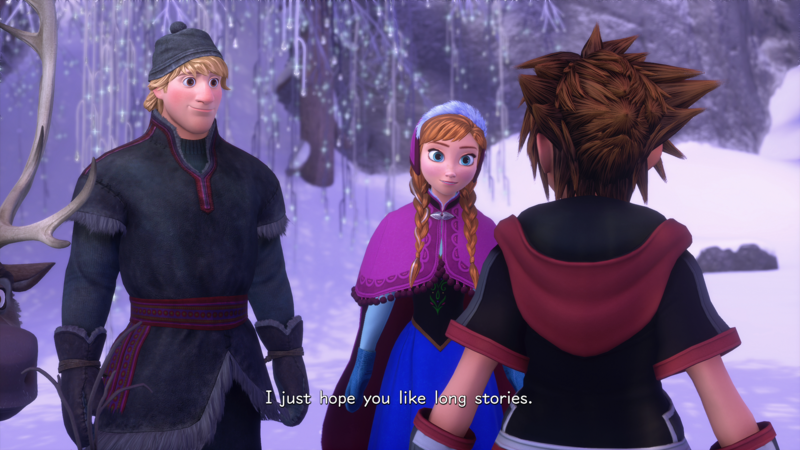 Kingdom Hearts III is also quite fond of lengthy cutscenes to convey its story, particularly in the back half of the adventure. 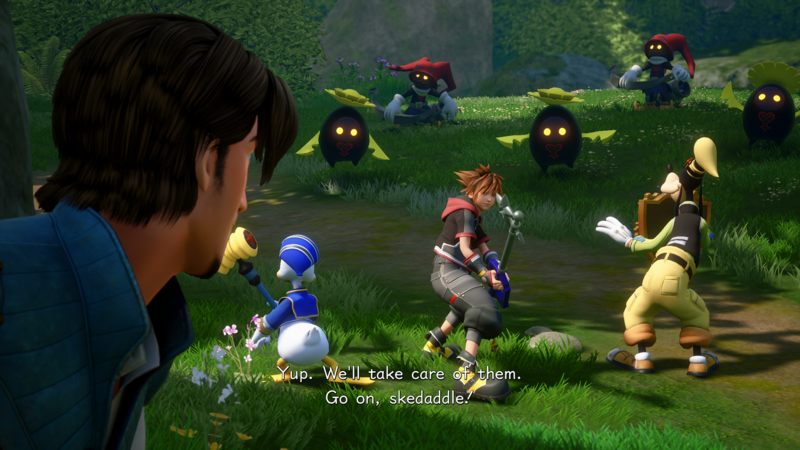 When venturing into the final hours of Sora’s adventure, the cutscenes would frequently extend into the five or ten-minute mark, giving the player an awful lot of story exposition through incredibly well-designed CG cutscenes and slicing in a battle or two just to keep the player engaged. Up to this point, beyond some introductory and ending scenes for each Disney world, the player is largely removed from the greater Kingdom Hearts plot to focus on what manner of issue is plaguing the princesses (and Herc) in each world. When you strip away the side plots of Maleficent and Pete going on in the background of each Disney world, many of the Disney worlds feature a very similar theme running through Organization XIII is looking for another seven princesses pure of heart to fulfill their endgame. To do so, the various Organization members try to make a mess of things just for the sake of discovering pure hearts or vessels. Usually, this involves invoking the wrath of whatever antagonist existed in the original Disney movie and squaring them off against Sora and his arsenal of transforming keyblades. I felt the Disney plots were the best parts of each world, although so many plotlines were identical to their movie counterparts. Both the Kingdom of Corona from the Tangled movie and even Frozen’s land take numerous story beats (and even song and dance routines) from their respective movies and injects Sora and gang into the background. Perhaps Kingdom Hearts III was created solely so Nomura could take a crack at re-recording Let It Go. Even non-Disney fans or first time Kingdom Hearts players can find pure joy in Sora’s final adventure if all they’re looking for is an action RPG with great combat. Every iteration of the keyblade that Sora wields in combat has been building up to his arsenal in Kingdom Hearts III. The combat has been vastly improved beyond merely swinging your keyblade at a heartless and throwing in the occasional cast of Fira or Cure. Of course, the reliance on jumping and aerial moves does leave the combat a bit floaty as with previous Kingdom Hearts games, and while the camera does have hiccups with tracking the action or not getting stuck on the terrain in certain areas, it’s all improved from the last few Kingdom Hearts titles I’ve played. Sora’s prowess with keyblades over the last decade and a half has manifested into a fighting style that excels not just in ground combos but also aerial launchers and finishing moves. Many of the keyblades that Sora acquires from the various worlds he saves can be transformed into weapons of a greater power: spears, dual-wielding guns, and giant hammers are all equally devastating in Sora’s pure hands and three can be equipped at a time and freely swapped about even during combos. I found myself leaning most into the weapon acquired from finishing up a visit with Sully and Mike Wazowski, a keyblade that first transforms into a pair of giant claws and secondly into two yo-yos that work amazingly well for larger groups of heartless foes. For the weapons that do transform, it’s as simple as fighting with them long enough for a transformation (‘Formchange’) gauge to fill up and hitting the triangle button, which is also used to team attacks and just about every other contextual action in Kingdom Hearts III. This also includes trying to open up treasure chests only to realize you were one step too far and accidentally activated one of the Attraction special attacks. 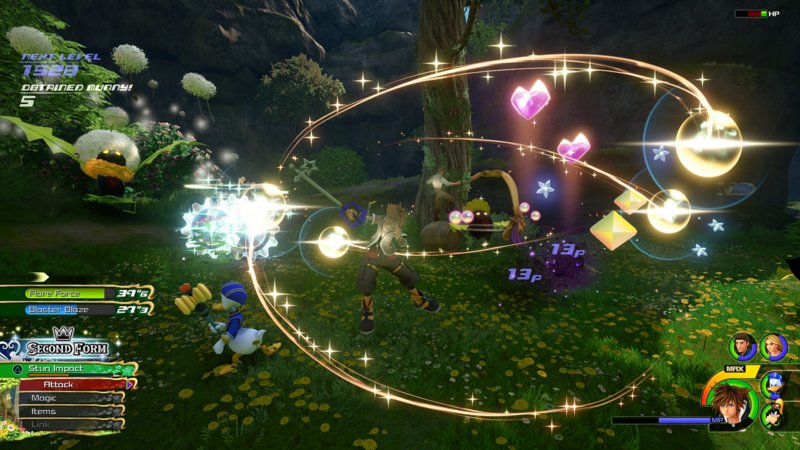 Attractions are the new theme park ride-based special moves that pop up randomly during the combat of Kingdom Hearts III. These are all based off Disney park rides and repurposed to be useful (and invulnerable) ways to thin the enemy ranks. Who knew that the otherwise tame saucer cup ride could be used as spinning tools of destruction? These attacks usually last for twenty or thirty seconds, just long enough to defend yourself against an enemy’s most dangerous attack and are usually powerful enough to take out all but the heartiest boss monsters out. I found the Attractions to be quite overpowered in regular combat and because they interrupted the flow of combat so much, I tried to avoid using them as much as possible during the second half of Kingdom Hearts III and stick to Form-changing weapons or other abilities like the Shotlock. The Shotlock is a homing barrage that changes depending on which keyblade Sora is currently wielding and give another reason to swap around equipped keyblades. 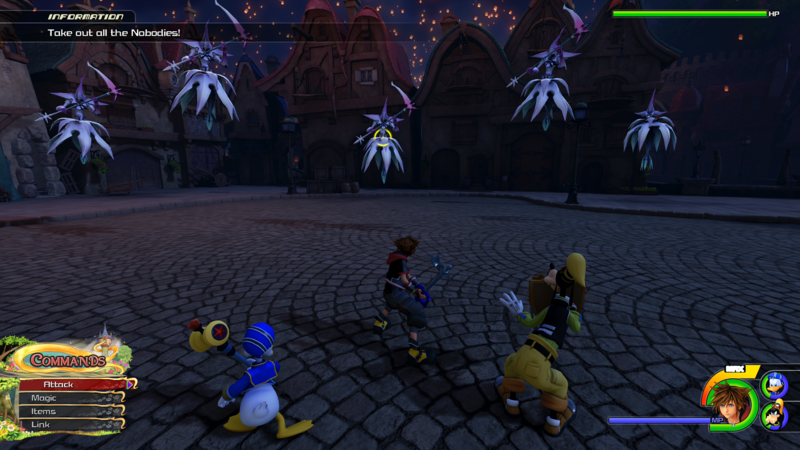 Graphically speaking, I think Kingdom Hearts III is the best-looking title that Square Enix has released to date. Many of the worlds that Sora visits are designed to look as similar to their movie counterparts as possible and in some instances look even better. It’s crazy to think that we’ve finally reached the level of technical development where a game can look as good as the original movie, especially with titles like Frozen and Toy Story. Even the Pirates of the Caribbean stage is quite stunning to look at, and while it’s quite strange to see Donald and Goofy animated in such a realistic fashion, the human characters like Captain Jack Sparrow and Will Turner are truly quite uncanny. The audio presentation to Kingdom Hearts III is no slouch either. Each world has some catchy tunes while you’re exploring and the combat themes are all designed to keep the player energized and motivated to keep the heartless down. One of the most surprising upgrades to Kingdom Hearts III was turning the Gummi Ship segments into a polished open-world fight sim. Each of the three galaxies that host the Disney worlds can be explored freely without fear of random enemy fire (although there is plenty of stationary turrets and defenses that usually hide crucial upgrade components). When you do run into an enemy, whether it’s a normal encounter or special boss fight, then it shifts to an on-rails shooter experience where that gummi ship you’ve built up is tested off against waves of enemies and/or one giant boss ship to blast apart. New upgrade pieces can typically be purchased from Chip and Dale, found by blasting apart asteroids and treasure crystals, or if you’re a real treasure hunter, blueprint pieces can be found in each galaxy to craft a powerful Gummi Ship that usually outmatches most of what you can build yourself. After the linear ship segments of the first Kingdom Hearts, I was a bit concerned that the ship combat would be just as simple and was left being more than a little surprised. The Gummi Ship segments might actually be my favorite part of Kingdom Hearts III to play and I loved exploring each galaxy before tackling a new world. Now that the story has finally come to an end, was the wait for Kingdom Hearts III worth it? In many ways, I could absolutely have to say so. This has consistently been one of Square Enix’s best action RPG series and the combat has been elevated to a level that no other developer could match. There’s still the issue of camera controls and contextual attacks that can lead to pulling off the wrong moves, but Sora and the Keyblade Hero 3 are in peak form this time around. The story, on the other hand, is far more convoluted and massive story dumps on the player detract from the final hours of gameplay. If you’ve been following the story so far, these scenes can reward you with a massive payoff that can help you feel a myriad of emotions by the time the credits start rolling. However, if you’re a bit of a novice like myself when it comes to the 15 years of Kingdom Hearts lore, you may find yourself scratching your head and wondering just what happened in those last few hours of wielding the Kingdom Key. Reviewed on PlayStation 4 Pro (code provided by the publisher).